The luxury Golfside neighborhood of Lansbrook in Palm Harbor Florida offers serenity and privacy with breathtaking waterfront views of ponds and conservation from many of the one and two-story moderate homes for sale. 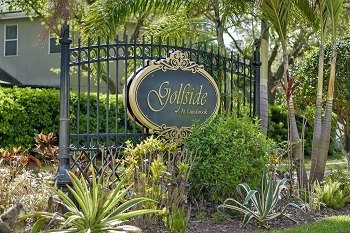 For the avid golfer, Golfside has its own golf course nearby, and for the water lover, there is the boat slip and dock for easy access to Lake Tarpon. Located off Tarpon Lake Blvd in the East Lake area, these eye-catching homes range in size from approximately 1600 to roughly 3500 sq. ft. Built in the late nineties, homes are three to five bedrooms, many with upstairs bonus rooms, vaulted ceilings, functional inside utility rooms, large walk-in closets, separate formal living and dining rooms, and eat in kitchens with attached family rooms. The exterior of most homes includes beautiful mature landscaping and tropical foliage, two and three car garage, a screened lanai and heated in-ground pool. Walk to the community owned park and playgrounds. A short commute to shopping, entertainment and local beaches. The is a great area that boasts many highly rated schools which is a plus for families with children. As leaders in Palm Harbor since 2002, we are certain that we can help you get the best value and price for your home. Call us today at 727-314-1000 and mention you'd like information on our flexible commission plan to get the most money and freedom when you sell your home.